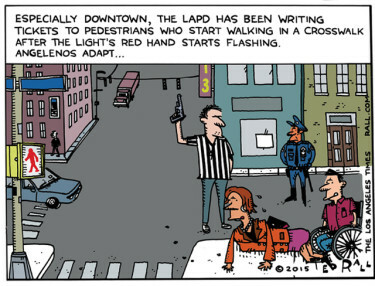 Did L.A. Police Break the Law to Get Ted Rall Fired? Veteran American political cartoonist Ted Rall has been fired by the LA Times based on a poor quality, sometimes unintelligable audio tape made by a police officer ticketing the cartoonist for jaywalking in Los Angeles 14 years ago. At issue are competing narratives of that 2001 jaywalking incident. In a May 11 blog for the LA Times website, Rall recalled that he was arbitrarily handcuffed and pushed up against a wall by the ticketing officer at the time. 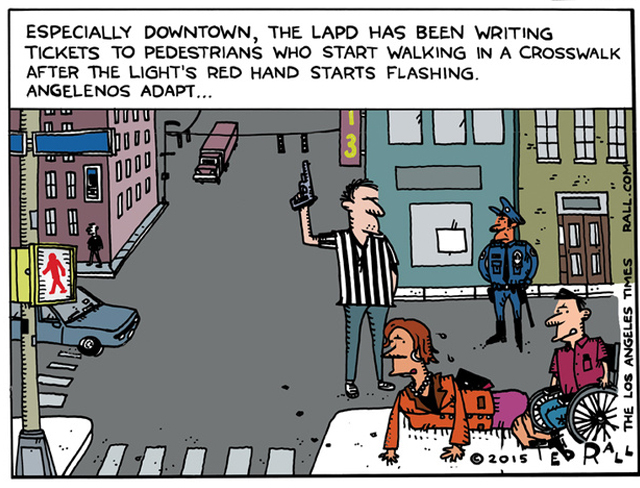 The blog posting accompanied a Rall cartoon for the paper targeting current LAPD pedestrian crosswalk policy. Following Rall’s blog post, a copy of an audiotape made by the officer involved in the 2001 jaywalking bust was made available to Times editorial-page editor Nicholas Goldberg. Rall had done hard-hitting cartoons for the LA Times since 2009.